This truly is a beautiful book; full of colorful illustrations. Any bird lover will enjoy this book. I know I do. I've already referred to it a half a dozen times in the few weeks I've owned it. Love birds? You'll love this book. This attractive and informative book of 600 species includes a "special collection" of more than 100 species that are rare. Each portrait includes full-color original artwork; details on identification, habitat, nesting, and food; and a color-coded range map. This attractive book, the product of 16 writers and 22 artists, consists of over 450 page-length species accounts which feature a high-quality color painting, a half-page anecdotal narrative essay, a range map, a drawing, plus small sections detailing the bird's identification, habitat, and food. Smaller accounts (three per page) for 117 scarcer birds follow the full-page ones. Appended is a 40-page section with thumbnail sketches of the best birding areas in the United States and Canada. 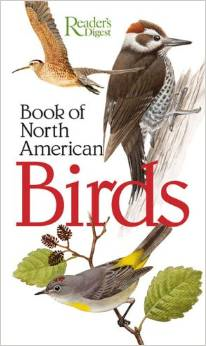 This is not a reference book for seasoned birders, but will serve admirably as an informal source of selected, basic information on 600 species, the ones most likely to be seen in North America. Recommended for public libraries.